wow didn't realize it's been five days since our last post. we've been too preoccupied by other things. downloaded the entire "project runway" season 6 (now on my lifetime) because we want to start on season 7 asap because we heard there's a filipino among the final 16 designers (hope he wins!). so we've been having PR marathons on our mac. and we've been doing some home improvement chuvas—spring cleaning, setting aside junk for the junk lady and clothes to be donated, organizing the linen closet, buying actual light fixtures for ceilings that only have bulbs hanging from them (ugh) etcetcetc. gazh, in the process we found fabrics we bought years ago and meant to have them made into something and just forgot all about them! and we've been—yes, finally!—exercising! we enrolled at the rockwell club and have worked out a grand total of three times since the year started. taking it slow with one-hour walks on the treadmill while watching re-runs of "america's next top model". we're such a lampa-doodle. such a sissy. hopefully by next month, it turns into running (and we lose at least an inch from our hips). but we got so excited when someone posted this piece of news on facebook and just had to share: could it be? will apple finally introduce the macbook mini we've been dreaming of?? 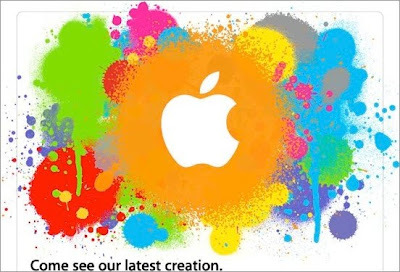 this invitation was sent out to the american press for an apple unveiling on january 27, 10am pacific time, at the yerba buena center for the arts theater in san francisco, california. that'll be january 28, 2am manila time! can't wait! !